Ahead of the Frankfurt Motor Show to be held from the 17th in Germany, Hyundai has revealed the “Hyundai N 2025 Vision Gran Turismo” and its full scale model. This car will be coming exclusively to PlayStation®’s Gran Turismo video game series. The Hyundai N 2025 Vision Gran Turismo powertrain is based on the world’s first mass-produced Hyundai hydrogen fuel cell system, highlighting Hyundai Motor’s passion for performance and sustainability. The total system output is 650 kW (871 HP), with the dual fuel cell stacks providing 500 kW (670 HP), and the super capacitor system generating an additional 150 kW (201 HP) by using energy regeneration when braking. This remarkable power is delivered through four high-powered independent in-wheel motors, which provide uncompromised traction and immediate response. The compact, lightweight fuel cell stacks and rigid CFRP monocoque structure help to keep the weight down to 972 kg, giving it a power-to-weight ratio that rivals the most exotic supercars in the world. Combined with a low centre of gravity, this power and performance sets the car up to perform on the most challenging of race tracks, encapsulating the thrilling premise of N sub-brand cars. As air flows through Hyundai Motor’s trademark hexagonal grille to the boat-shaped underbody structure, the tube-type underflow air supply duct connected to the rear minimises pressure to the underbody to produce maximum downforce. In addition, the air brakes activate according to speed and brake usage which also reduces drag. Although the Hyundai N 2025 Vision Gran Turismo is based on eco-performance technology, the vehicle will strike a chord with enthusiasts merely by the deep growl of its powertrain. The sounds from the air blower’s turbine that spins at around 200,000 rpm, the unique frequency of the fuel cell stacks, the purging sound from the hydrogen cooling system and the high-pitched in-wheel motor harmoniously combine to produce a distinct race car rumble, further thrilling the driver. The Hyundai N 2025 Vision Gran Turismo’s design concept draws inspiration from aeronautics and from the tests performed at Rogers Dry Lake (formerly Muroc Dry Lake) where pilots and astronauts trained, risking their lives for the pursuit of space travel. This innovative and audacious spirit was the main motif for the design of the car. 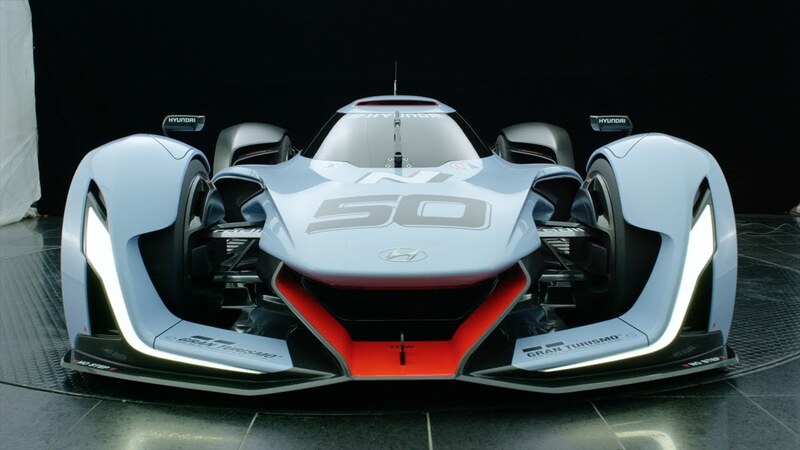 Inspired by aeronautics and formed by speed, the Hyundai N 2025 Vision Gran Turismo looks like a jet fighter on wheels that blurs the line between air and asphalt. Hyundai Motor designed this car to appear more like a crafted machine for grounded aeronautics. So, the car actually looks like it is floating. Furthermore, Hyundai Motor’s Sound Design Research Lab designed a unique racing car sound system for fuel-cell based cars to maximise the emotional delight of this highly-spirited yet eco-friendly model. Armed with all of this future technology, the Hyundai N 2025 Vision Gran Turismo truly represents the potential of Hyundai N product’s sporting future.